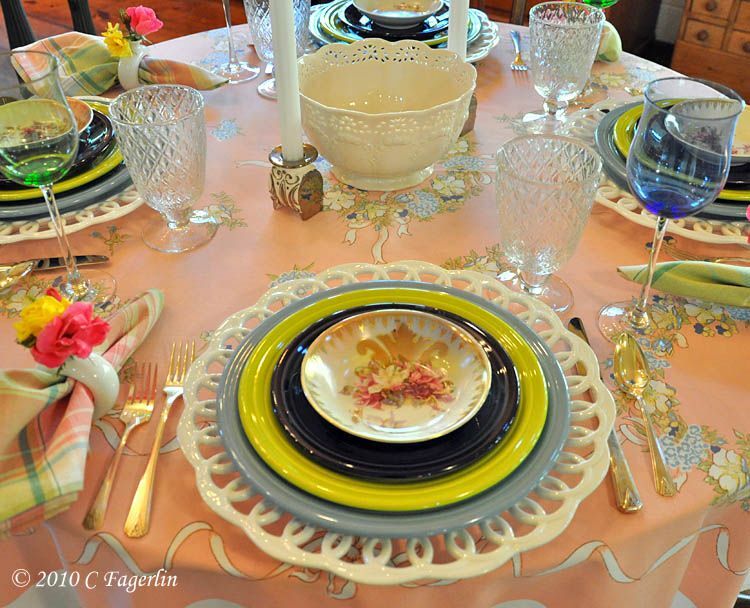 The Little Round Table: Tablescape Thursday: It's Pink ... and Plum and Lemongrass and Periwinkle! 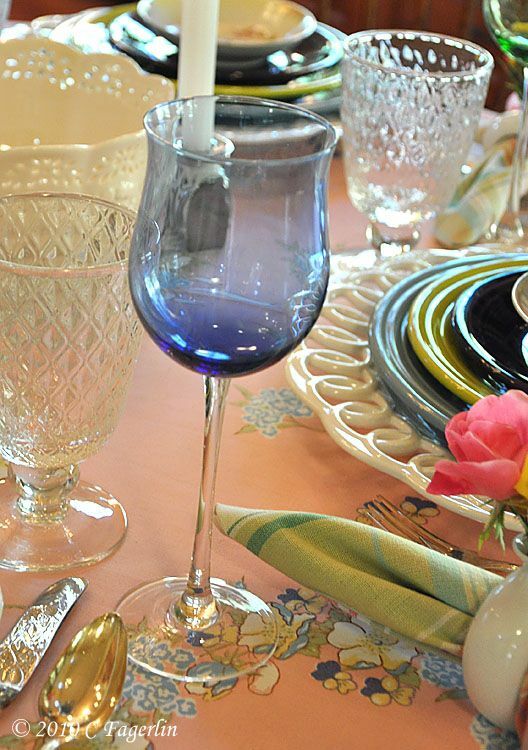 Tablescape Thursday: It's Pink ... and Plum and Lemongrass and Periwinkle! for Susan's weekly tablescaping party. Please come join the fun! pink ground with floral wreaths, sewn in tag. The name of the print is "Cornwall". There is a similar cloth by the same name that has no center wreath. "Saturday Night Special: Girly Girly Pink"
Post 86 Fiesta. 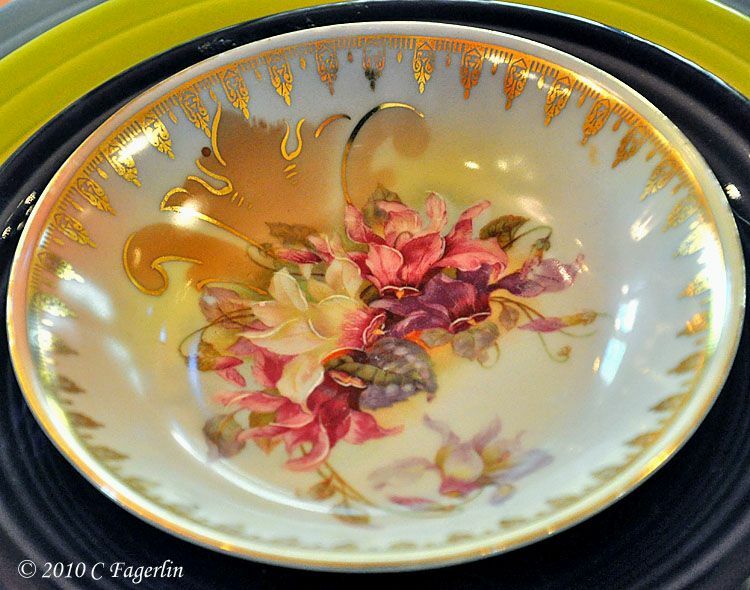 The flowered berry bowls are vintage German porcelain. along with 'Pink Knock Out'. 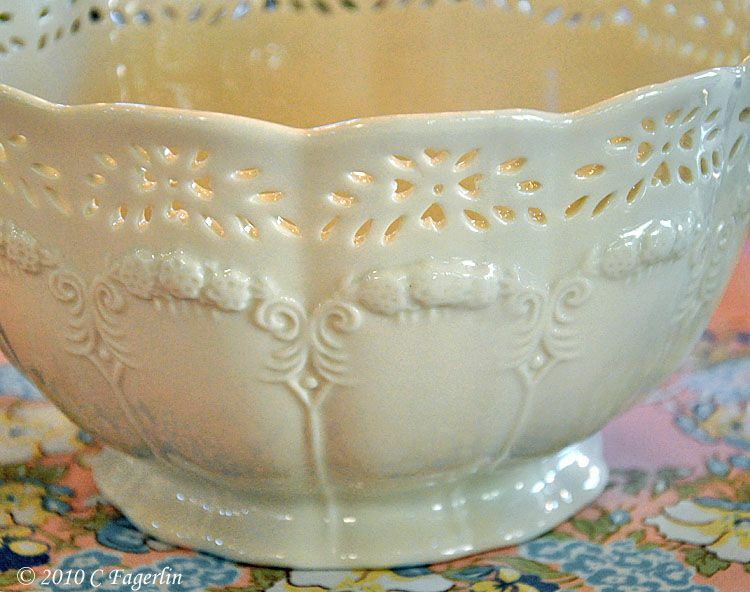 Cutwork bowl from Home Goods, glassware below from Pier 1 last season. 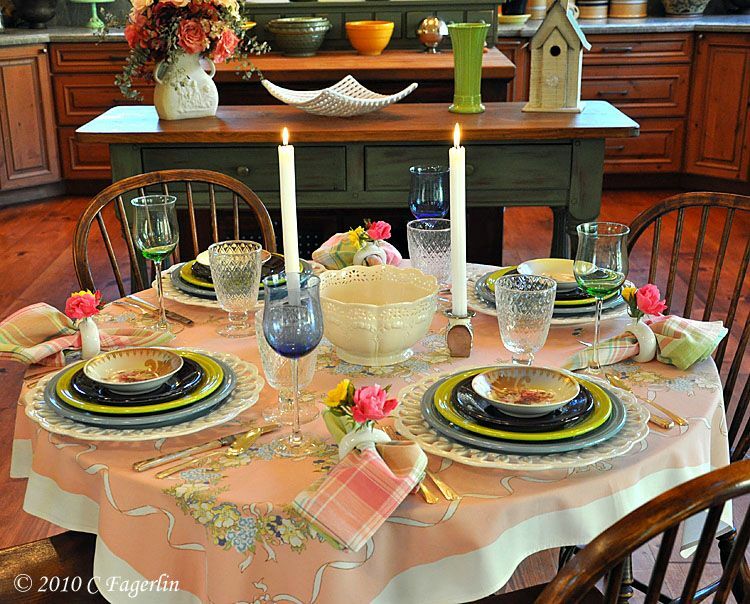 Thanks for coming by again for Tablescape Thursday, I do appreciate your visiting! 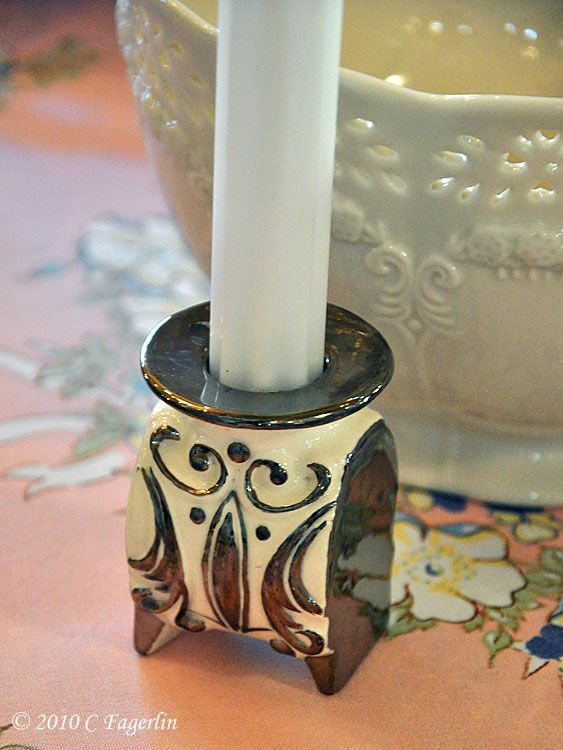 Candy, you win the prize for the best napkin rings in blogland-ever! They are just so neat, and work for any setting, so special-enjoy! What a feast for the eyes! 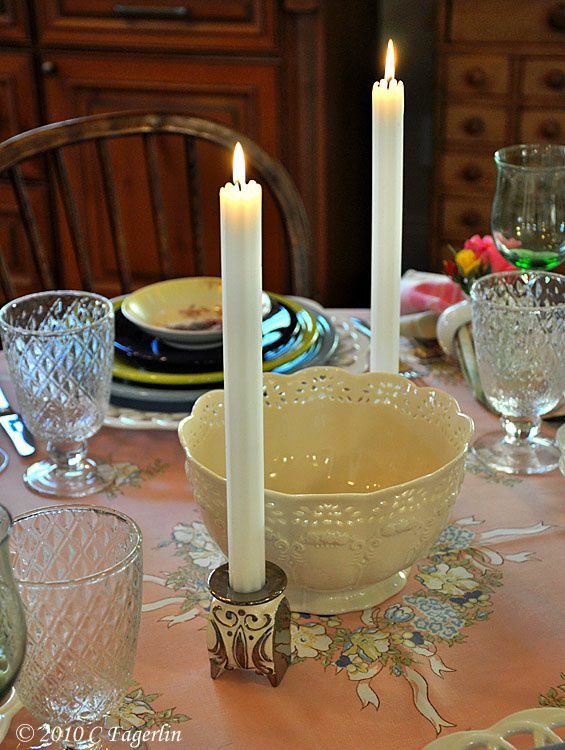 Love those napkin rings and the vintage tablecloth. I love it all actually! Another delightful table. 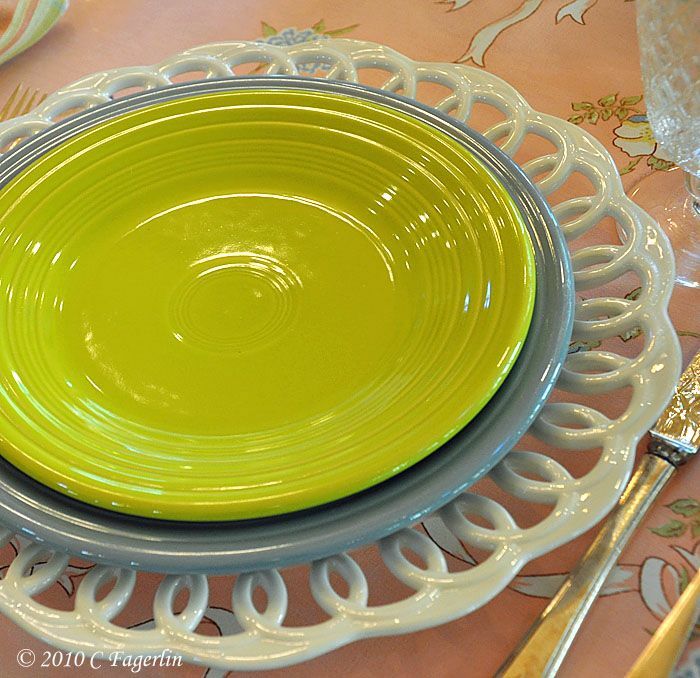 You are so clever with your choices of plates and linens. I'm super impressed! 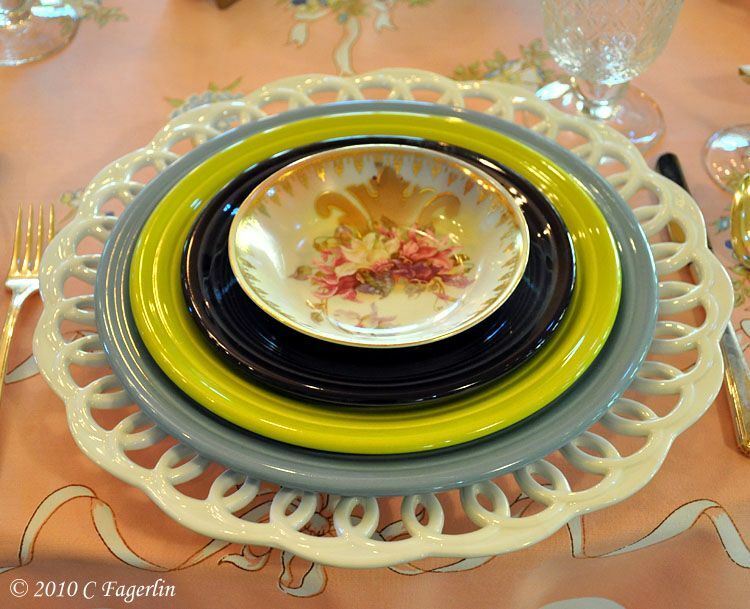 Love how the colors of your dishes pull the colors out of that beautiful tablecloth. I've been looking for a pansey ring. I remember yours. That tablecloth is so pretty. You found some lovely things to match all the colors. Oh, what a beautiful table you've created! 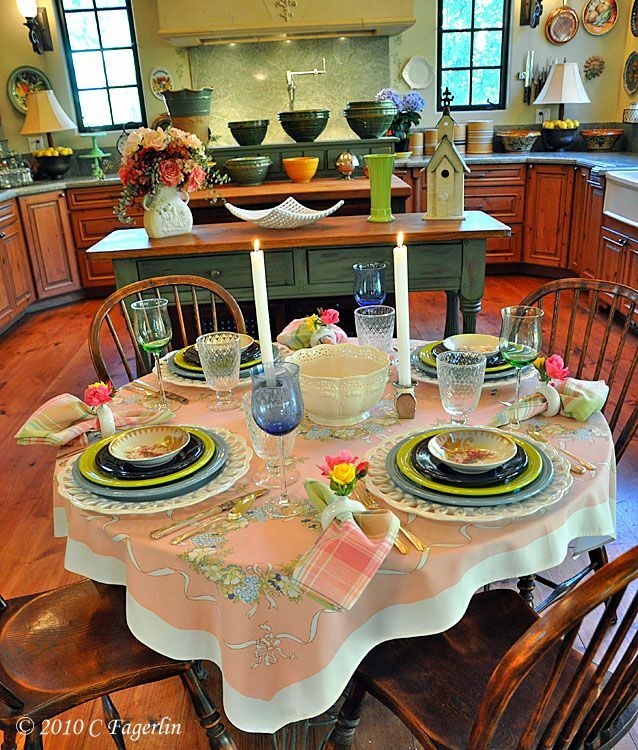 The tablecloth is just gorgeous and the layers of dishes are heavenly. I love how your tablecloths are always pressed. It makes a difference. I'm starting on my second color - tangerine. I have 2 place settings so far. Will have all 6 by fall to create an autumn table. Can't wait to see yours! 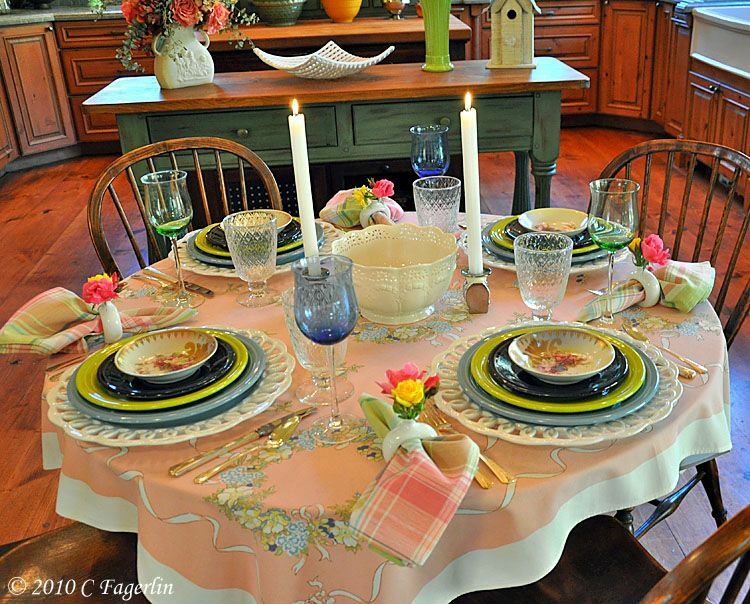 This is such a cheerful setting--I would love to come over and have a bite to eat with you! Once again I wish I was your neighbor so that I could come for lunch/dinner because your TS's are always amazing. Love those candle holders. 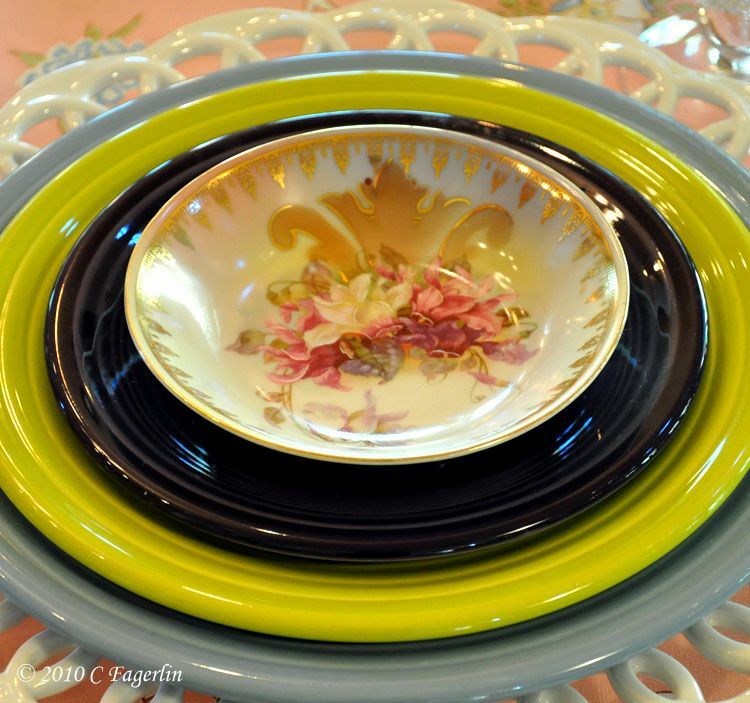 I love the color combinations and ofcourse the napkin rings! 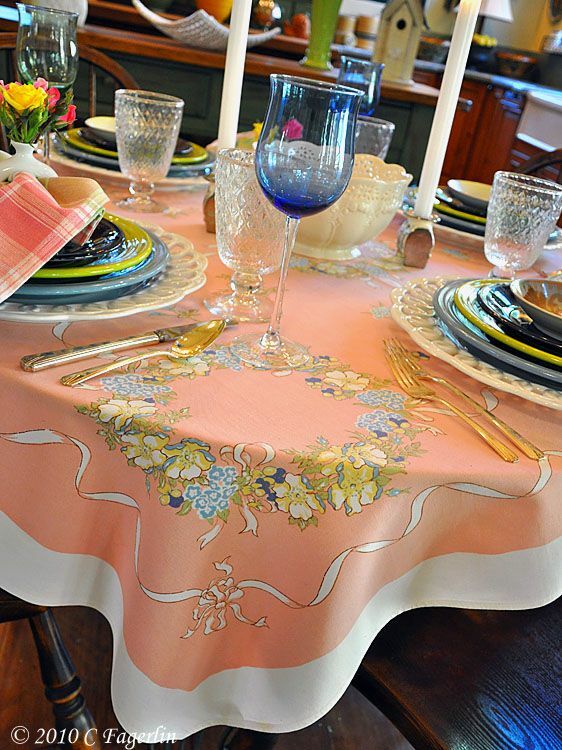 The table cloth, the dishes, its stunning! All is so sweet and beautiful, cute, cute napkins rings! Very pretty! 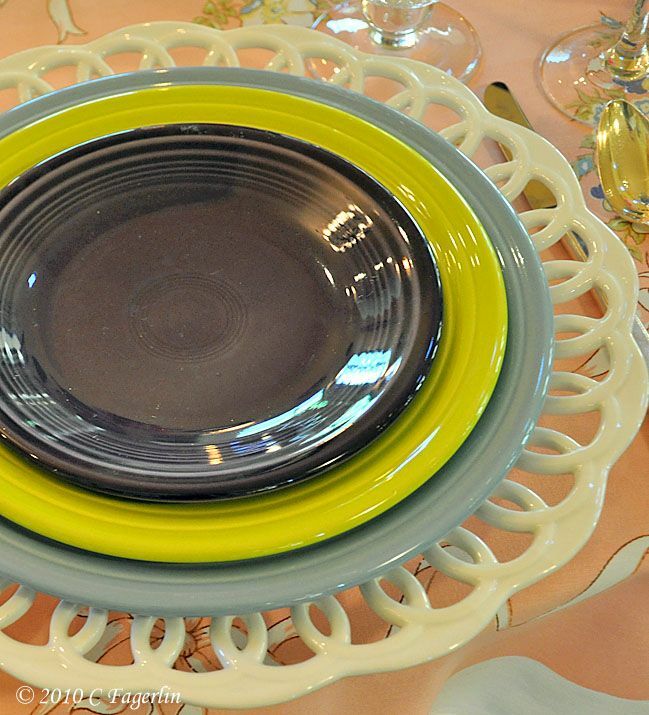 I like those lime green plates on top of the black ones - very striking! So beautiful. Your kitchen is the perfect backdrop for a special table. Thanks for sharing. Thanks so much for your generous praise, I do treasure your comments. I love you...I love your tables..I love your plates...ha ha ha ha ..Loves in Turkey! Candy, I am really entharalled with your napkin rings. What a genius idea. The whole table is full of nice details. Lovely. 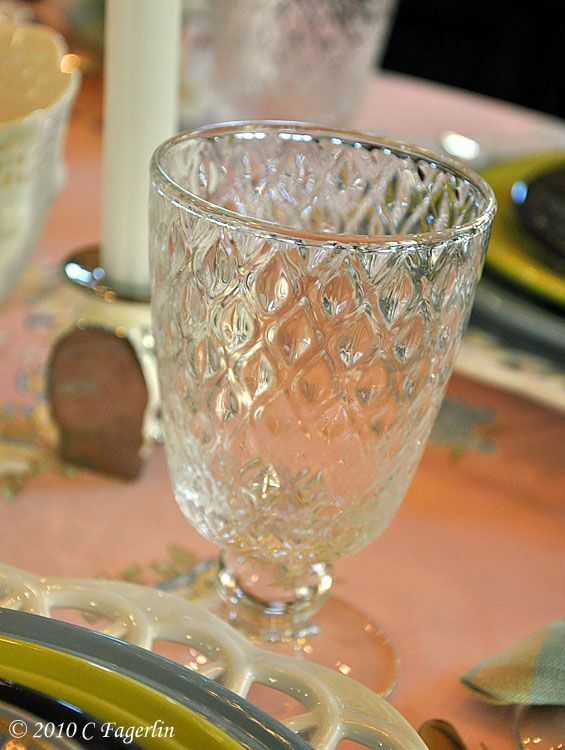 LOVE the vintage tablecloth! Just gorgeous! 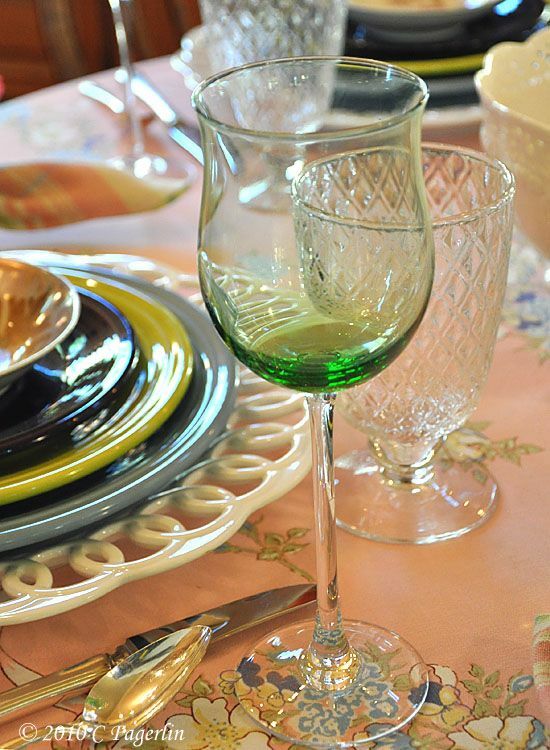 And you've set another beautiful table with your incredible Fiesta collection. I think I "need" some periwinkle dishes. AND some lemongrass ones to go with them! Those napkins rings are darling, too. Pretty table, especially against the background of your kitchen. If you've given a tour of that I missed it and would love to see it some time. Jane F.
Candy-Love the way you put those colors together! They look great. Your table as always is fabulous! Thanks for sharing with us. This is a fabulous tablescape. Very coordinated and I love your tablecloth. Your table is lovely as usual. I walked into an antique store this past weekend and I thought of you. It was filled with Fiestaware! Thanks for sharing and have great day! Lovely, lovely table! Glad I stopped by to see it! What a wonderful table. I do so enjoy your blog as it is always inspiring. The tablecloth is just amazing. I have those napkins, but they are stored in the "Easter" box. I'll have to pull them out!! Thanks so much for posting such beauty. Wow, coming to your beautiful blog is a welcome respite. I love your pretty pink tablescape. I have those same vase napkin rings. The tablecloth is absolutely beautiful! 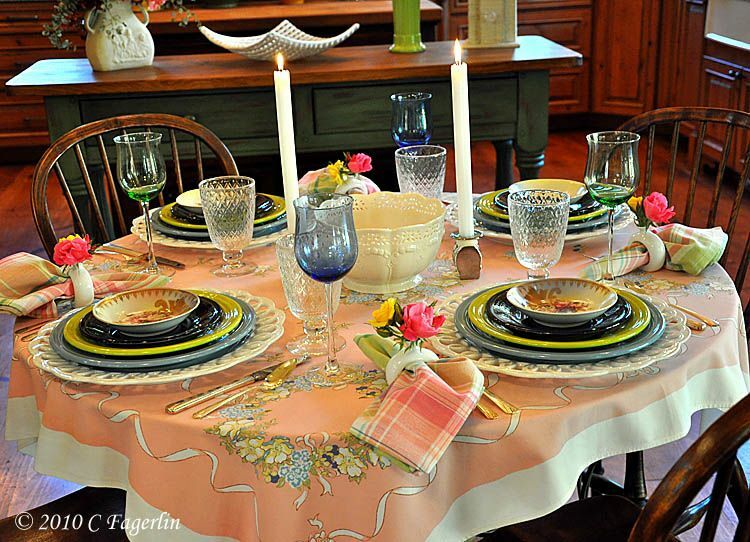 You've done a wonderful job of incorporating its colors throughout this charming table setting. Your photographs are always stunning -- so crisp and fresh looking! Nicely done. Lovely Table! 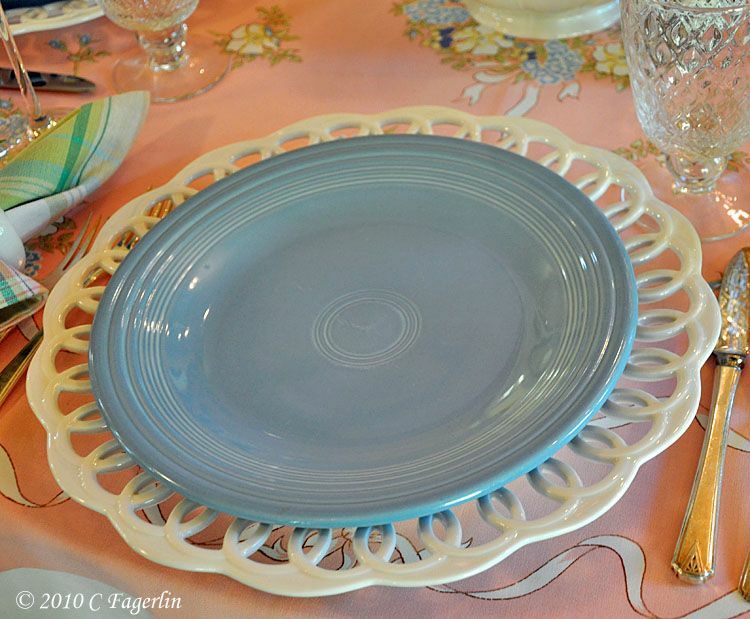 I LOVE the white plates/chargers- whatever they are! Thanks so much everyone for all your lovely comments on this pink creation! Again, thanks for coming by, I do appreciate it. Oh my, everything is so beautiful. It's hard to pick a favorite. 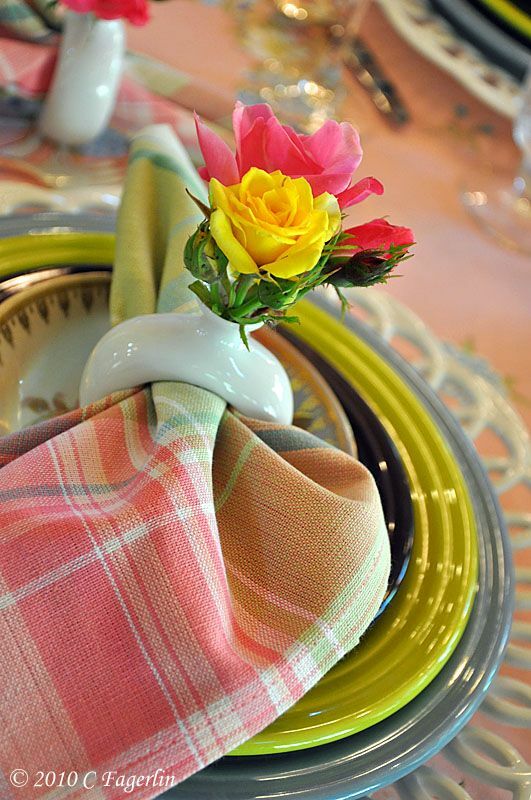 I must say, those bud vase napkin rings are beautiful, especially with the roses you used for this gorgeous tablescape. Thanks Requi, I'm so glad you stopped by and enjoyed your visit!